The Occidental Dancer: 2012: The year of thinking UP! It's not too late to wish you all a happy new year, is it? 12 days is a mere blink of the eye, chums, although it does seem like the year is a lot older than that already. Hopefully you are all hale and hearty, and awash with that glow that comes from the feeling - however illusory - that the start of a new year is the same as the chance to start life itself again. May you have an absolutely kickin' 2012. In my many, many years on the planet (I officially became middle aged over the holidays), I have learnt that new year resolutions are bootless things, fit for nothing except inducing guilt when they remain unresolved on 31 December. The prosecution cites exhibits A and B: The Raqasa's resolves to learn to drive and to achieve proficiency in French, both of which are now entering their second decade on the 'To Do' list. If I dwelt on it too long, no doubt I would weep at the vision I have of myself walking off the mortal coil and wishing the world "Farewell" instead of "Adieu". But weep I shall not, thanks to my new approach to the whole irritating "New Year = New YOU!" school of thought so beloved of weekend newspaper supplements. Instead, I am henceforth adopting a Theme of the Year. This means that, rather than focussing on meeting specific aims by set deadlines, I will be trying to achieve my goals through stealth and with minimal perceived effort. The posture thing is part of it for me because I do know that I have a tendency to resemble a hula hoop when I sit or dance. However, my real theory is that by invoking the word "up!" whenever I'm thinking negatively or about to make a choice I know is going to bug me later - e.g. electing to spend the morning in bed instead of going to the gym (a very literal form of "Up!") - I will have a positive, productive year without even really trying. This was the week that "Up!" kicked in and I've made three visits to the gym and two dance classes already (the looming date with Suhaila Salimpour's London weekend workshop has also been quite the motivator). Sure, it's easy to get out of the starting blocks but it's harder to finish the course. I'm not promising myself that I'll never have down days or always skip dessert, but "Up!" seems like a good place to start. Yeeeaaaahhhh ... wish me luck with this. Meanwhile, I'm off to the third heat of Bellydance Trophies on Sunday and, as usual, I'll be tweeting the action in my customarily difficult-to-follow and not-particularly-informative style. Hope you can play along! *NB - The Alexander Technique does not hold that good posture is a simple matter of sitting/standing "up straight" - in fact, just the opposite. "Holding yourself up straight" without proper technique often leads to all kinds of damaging muscle tension, and generally can't be sustained when fatigue kicks in anyway. 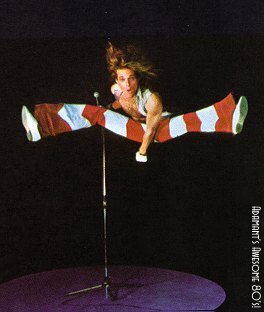 And do you know, as I was pasting it into this post I was thinking about our "David Lee Roth's lycra made me want to dance" conversation!